It is a universal truth that Italy is a place of beauty. 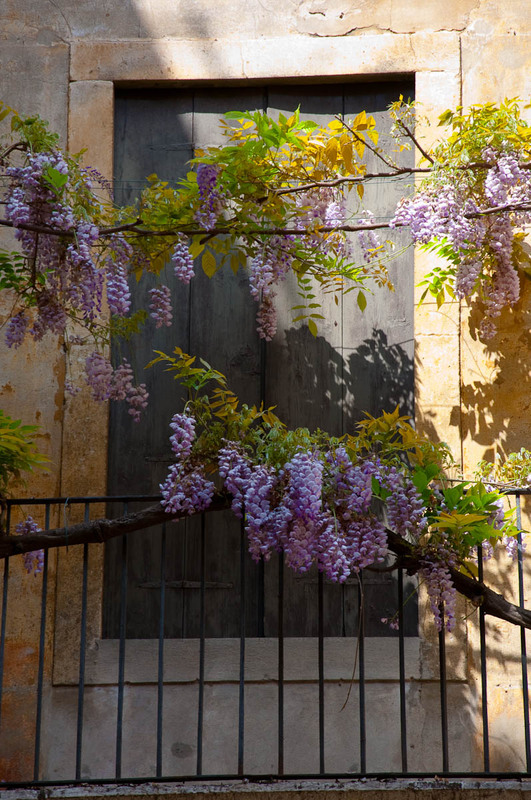 Come here during wisteria season though and you will feel like you have found the secret door to Fairy Tale World. 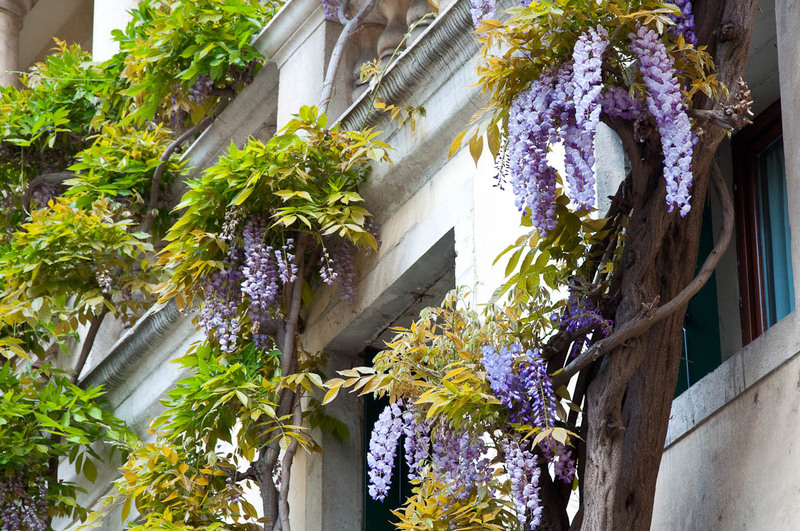 Perfect clusters of purple blooms drape themselves across houses and fences, porches and balconies. 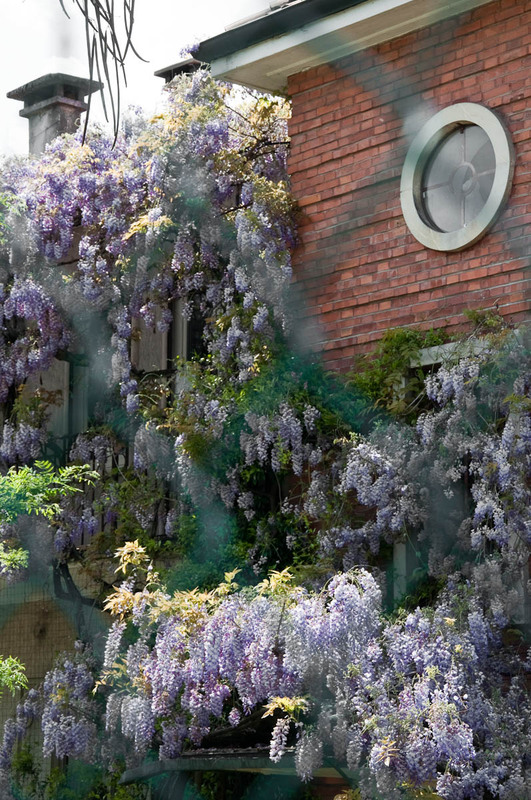 It is so beautiful to see that you feel like taking a walk through a town or a village just to admire the blooming wisterias gracefully framing windows and climbing high up peeling walls. And you better hurry, as this spectacle of spring doesn’t last long. 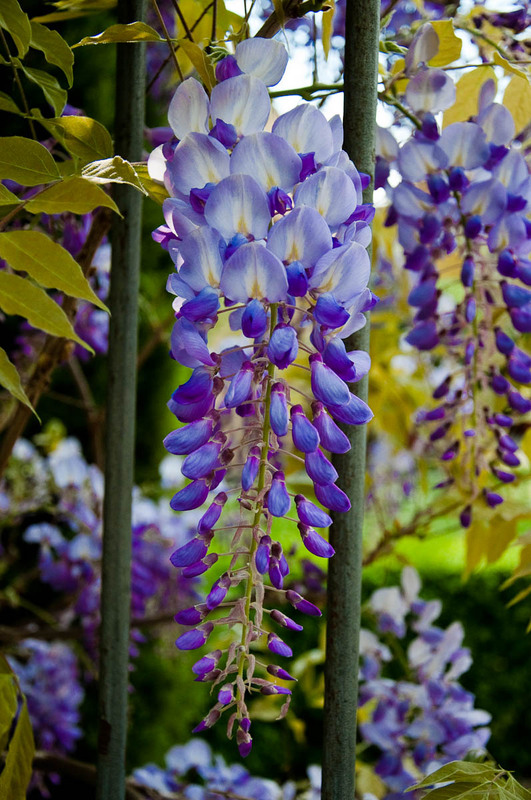 In a few short weeks the abundant purple blooms are gone, leaving behind themselves the memory of their gentle scent. 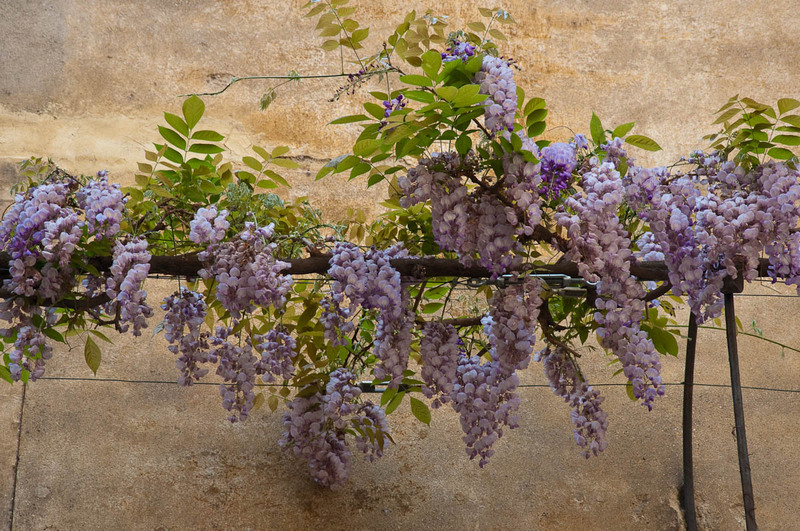 Just as last year, wisteria season in Italy took me by surprise this April. 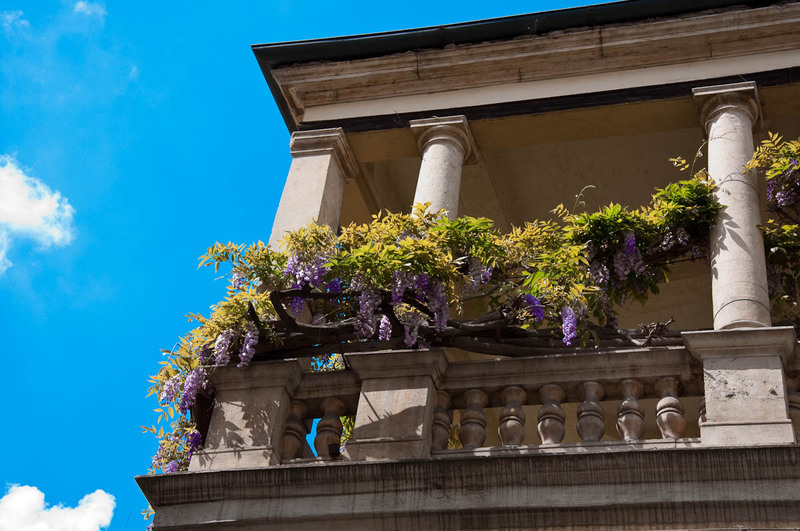 I had just returned from my week-short visit to Bulgaria and we were driving through Vicenza on our way to an appointment, when we spotted it – a gorgeous Italian villa the facade of which was fully covered by a blooming wisteria. Or ‘glicine‘ as it is locally known. It was gorgeous! It also seemed to have happened overnight. 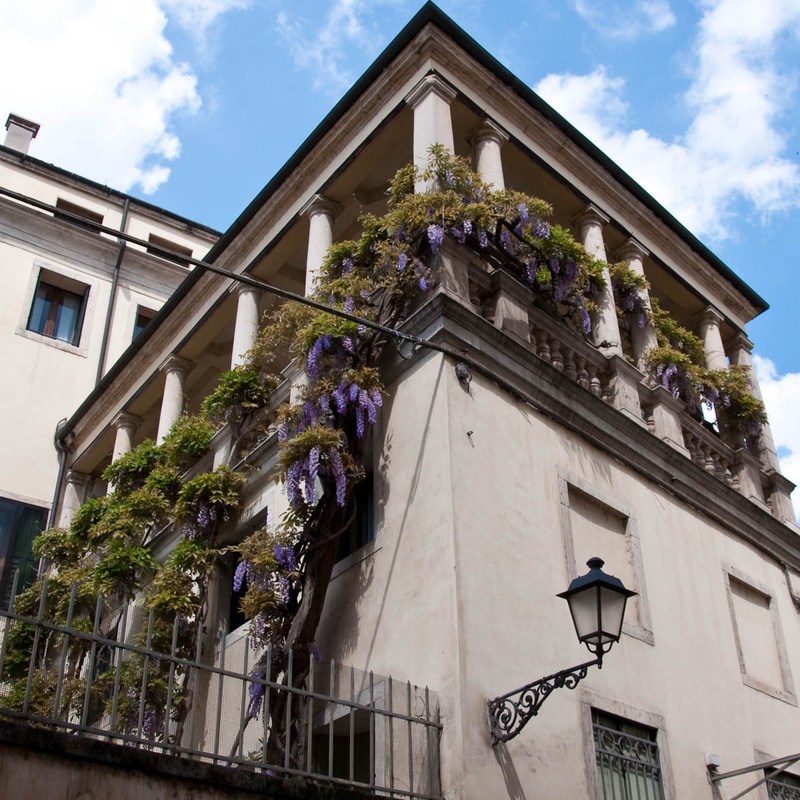 One day Vicenza was just waking up to spring and then the next, it was draped in lavish purple blooms hanging from just about everywhere. So, from that moment onward I was on a mission to spot as many wisterias as possible, to admire their blooms and their whimsical arrangements over gazebos, pergolas and lean-tos, before by the end of April they were all gone, washed away by the thunderstorms we have been having and the one really powerful hailstone shower which left the streets covered in ice pieces the size of walnuts. 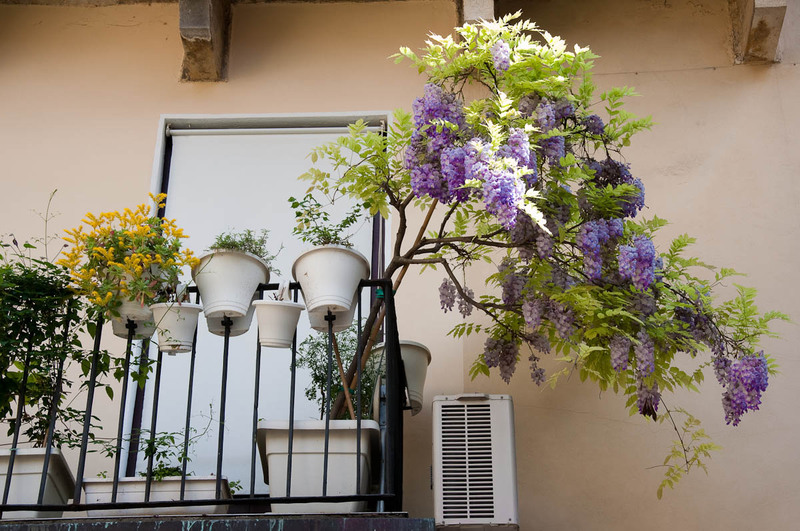 In my self appointed role of Wisteria Watch, I took several walks through our neighbourhood, admiring the gorgeous gardens of vicentini (as the good citizens of Vicenza call themselves). They were bursting with colourful shrubs, delicate irises and even fragrant lilies-of-the-valley. 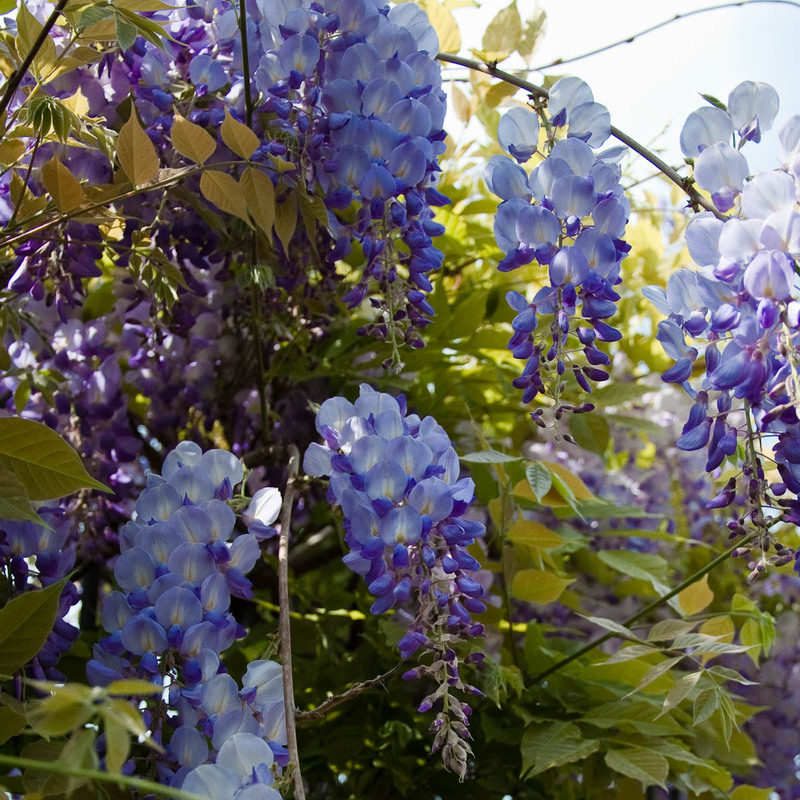 Still, the wisterias with their purple clusters, bright yellow-green leaves and twisted branches remained their most striking feature. 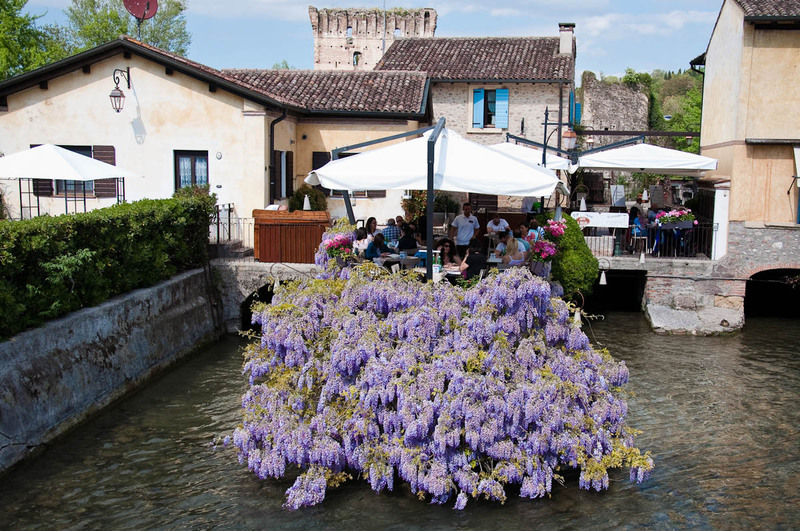 We also indulged in a day trip to our now firm favourite Borghetto sul Mincio. 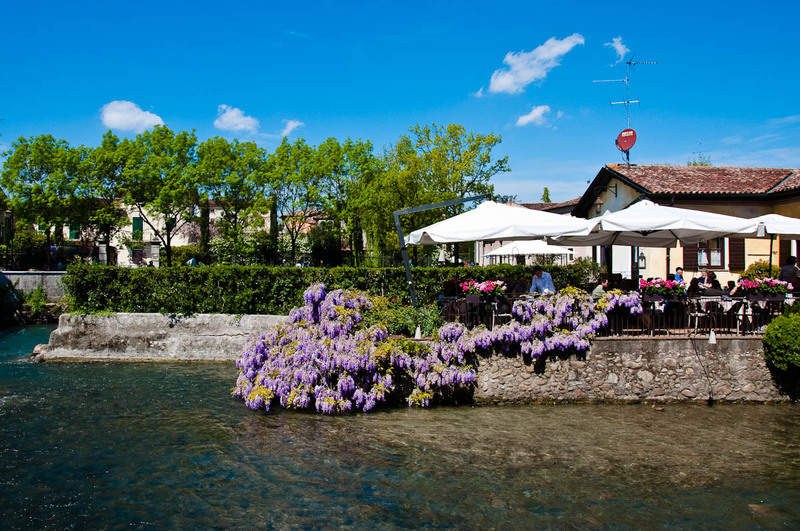 A charming village set on the fast and furious river Mincio, it is famous for its tortellini – delicious little pieces of pasta wrapped around the most amazing selection of fillings (more about them in a forthcoming blog post). 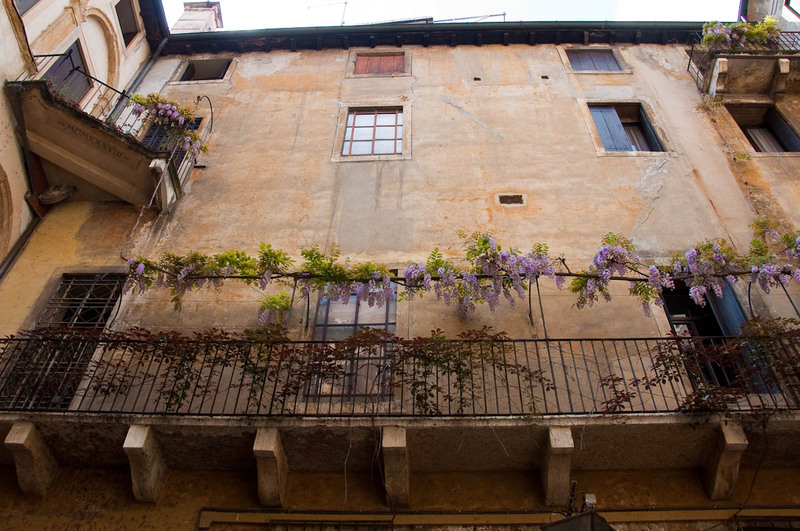 We walked through the narrow curving streets of Borghetto and everywhere we turned, wisterias were waving their branches at us through gaps in the wrought iron fences and from above porches. 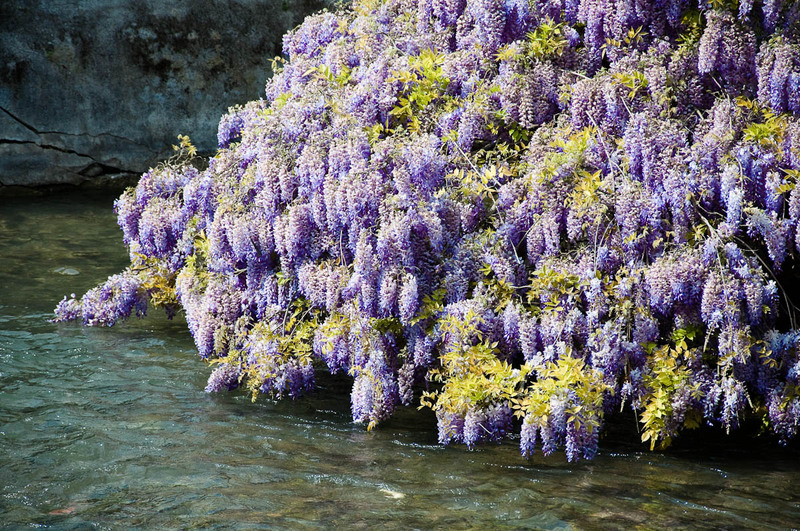 Their purple blooms were even draped all along the river shore. Strong brown branches, twisted in every possible direction, were supporting their delicate blooms and abundant leafage. 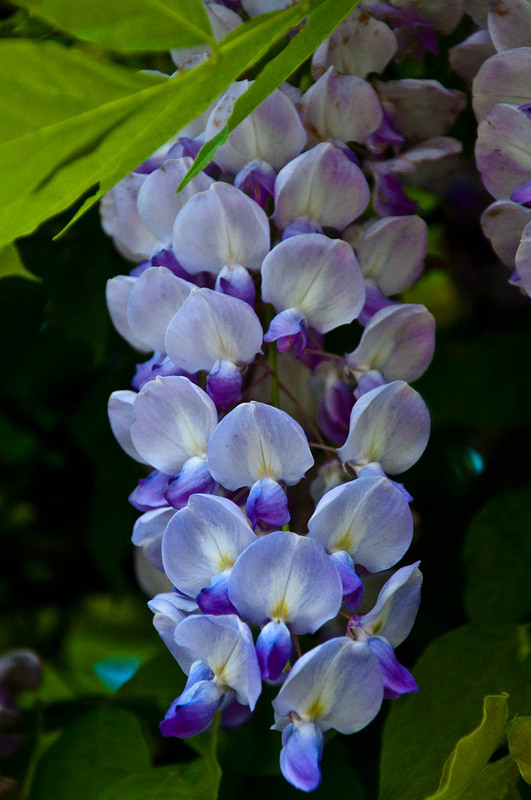 Looking at the purple petals, I realised that I had never stopped to think about the might of the trunk and the branches keeping the wisterias up and climbing high walls and structures. That was until we came across this telegraph post which was completely covered by the wizened gnarly branches of what at one point must have been a glorious wisteria shrub. In season a true cascade of purple blooms must have rained down the telegraph post and a deep green leafage must have embraced it all through the rest of the year. 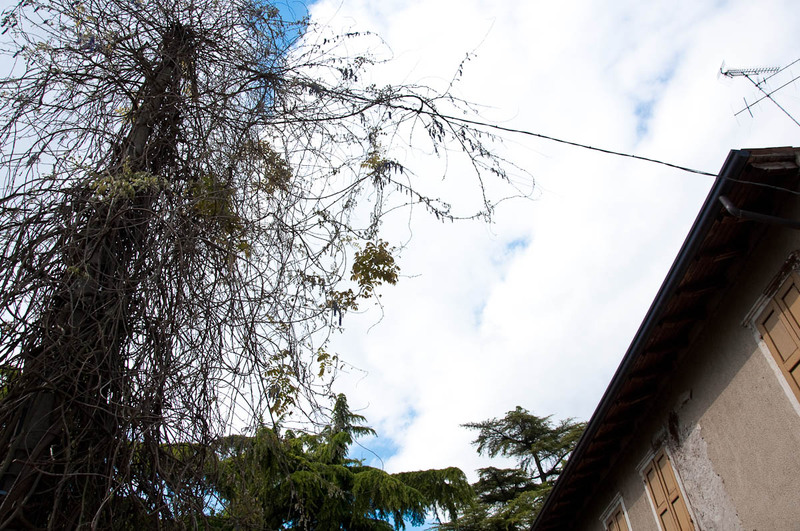 That was until the wisteria completely overtook it and spread its shoots across the electric lines. 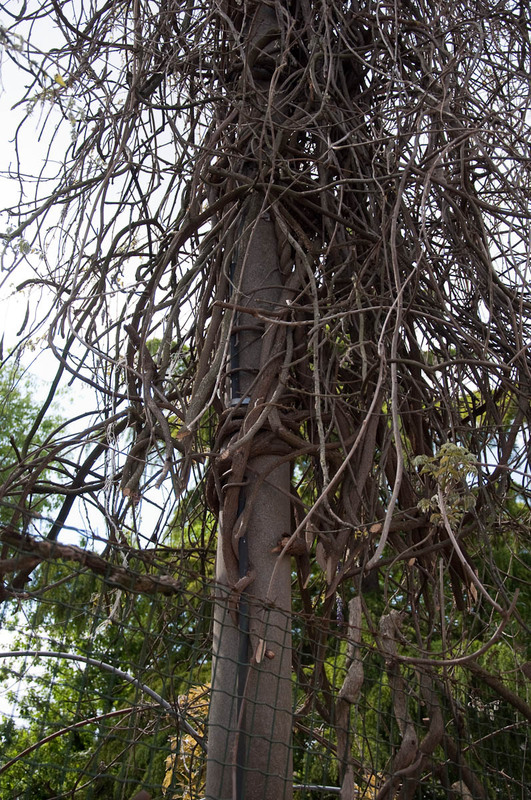 At that point it must have been deemed a fire hazard as the trunk of the shrub had been severed near the ground, leaving the impressive crown of branches still intertwined around the telegraph post. It must be a really difficult task to untangle this mess of a powerful growth which must have taken years to achieve its mighty proportions. 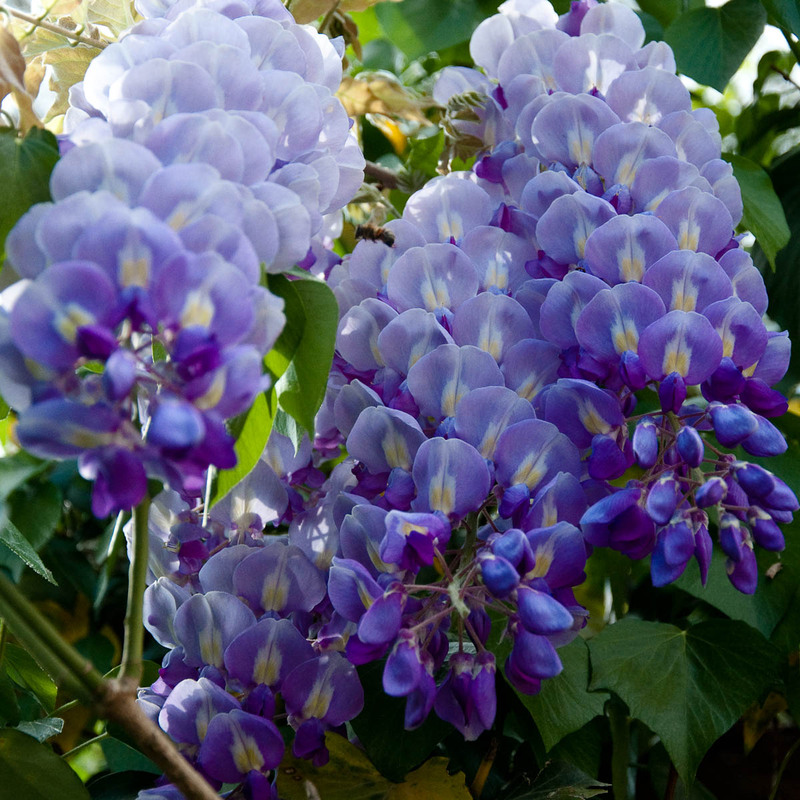 Still, it gave me a really good idea as to how vigourous and strong wisterias actually are. 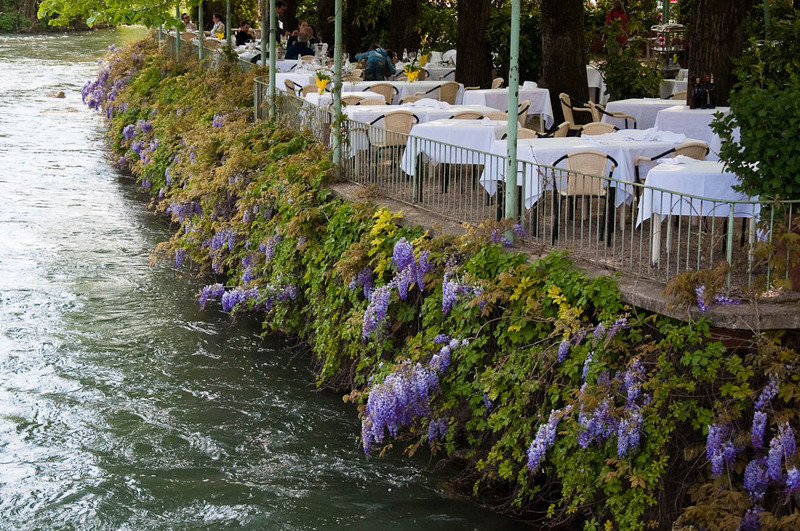 Later on, as we took our seats around a table in a former water mill which had been converted into a delightful restaurant, I glanced across the fast running waters of the river Mincio. 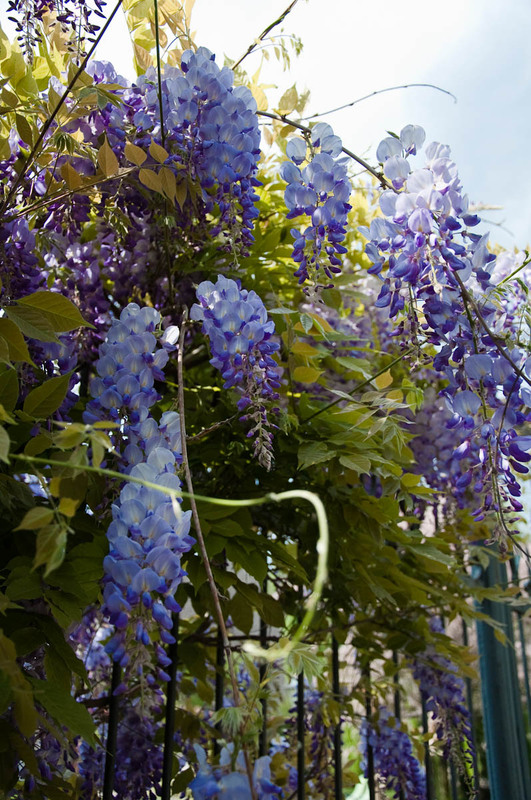 An abundant wisteria shrub had enveloped the edge of the al fresco platform of the restaurant just across from us. The purple clusters hung above the clear waters in which several fish were darting back and forth. After a hearty meal of the local tortellini and wild boar, I leaned against the railings to admire the scenery and for a minute or two just took it all in. From across the water wafted the wisteria’s fragrant scent. It was one of those little moments of pure perfection which make living in Italy so good. Thank you for reading! If you liked it, please, feel free to share on social media through the buttons below. Let me know your comments and have a great day! 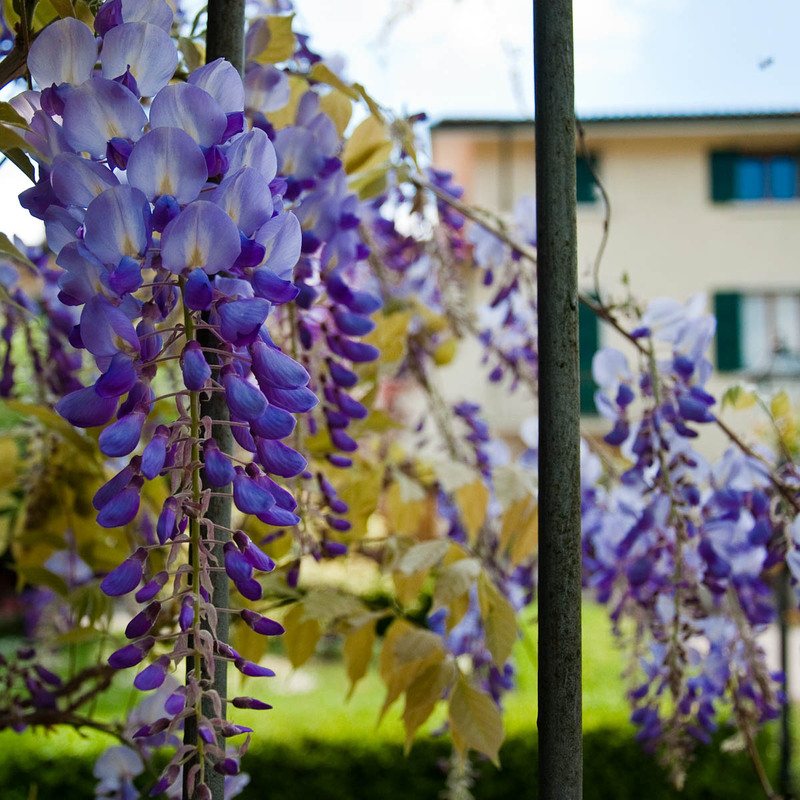 Here are some more photos of wonderful wisterias around the Northern Italian region of Veneto, where I currently live.